The boom of shale gas and other unconventional sources of natural gas and oil in the US have spurred a debate on the future role of these energy sources in France and other EU countries. Developing these unconventional sources of energy is expected to lower gas prices and to reduce import dependency. Within the European Union, France and Poland are believed to have the highest shale gas potentials. The main technology to exploit these sources, hydraulic fracturing ("fracking"), involves injecting a complex mix of water and chemicals under high pressure into wells to create cracks and fissures in rock formations that improve the rates of production. "Fracking" is feared to harm the environment, by contaminating groundwater, polluting the air, or provoking earthquakes. As a consequence, social acceptance of the shale gas industry is low in many countries. In France, exploring and extracting shale gas and shale oil via hydraulic fracturing is forbidden by the law since 2011. The same law also enables the government to revoke research permits for projects using hydraulic fracturing. However, a special commission may allow hydraulic fracturing for scientific purposes. This may be interpreted as an opportunity to change this regulation in the future. However, the members of this commission have not yet been appointed. This therefore raises the question of whether the current ban on shale gas will remain in place or not. To answer this question, we asked the energy experts if they expected the exploration of shale gas in France to be authorized in the future. Over two out of three experts consulted believe that exploring shale gas will be authorized sometime in the future. Almost one third of the experts expect the exploration of shale gas to become legal within the next five years. Hence, exploring and extracting shale gas in France is currently associated with high regulatory uncertainty. However, can extracting shale gas also be profitable in the EU, given that the geology and the existing infrastructure are very different from those in the US? Almost half the experts in our panel consider shale gas to be profitable at a price level of 20- 40 €/MWh. The average break-even price of natural gas should be approximately 31 €/MWh – slightly above the current price of approximately 27 €/MWh in the French wholesale market, and just below the future price of 32 €/MWh estimated for Europe in 2025 by the International Energy Agency (IEA) in their 2013 World Energy Outlook (New Policies Scenario). In response to the same question asked in the ZEW Survey in Germany in the fall of 2012, the energy market experts expected the break-even price for shale gas to be higher, within the range of 40-50 €/MWh, with an average of around 44 €/MWh. In line with the IEA figures for future natural gas prices, the ZEW report also concludes that conventional natural gas may currently be exploited at much lower costs in Russia, Azerbaijan, Turkmenistan and Qatar, amongst others. In addition to the capacity to transport natural gas from Eastern Europe or the Middle East to Europe, the infrastructure to import liquefied natural gas (LNG) is currently being expanded. Furthermore, the exploration of shale gas in the EU may face higher costs from additional regulation at the EU level. 93% of the experts in our panel expect new regulation at the EU level to affect the exploration of shale gas in the EU within the next five years. To date, there is no specific law governing exploration and extraction of shale gas in the EU, but 17 different pieces of legislation instead. The EU therefore intends to deliver a framework to manage risks, address regulatory shortcomings and provide maximum legal clarity and predictability to both market operators and citizens. While the EU parliament had called for a mandatory impact assessment on all shale gas projects earlier in 2013, the EU governments voted against it at the end of 2013. Full environmental impact assessment is still mandatory for very large projects (producing more than 500 000 m³ of gas per day). Even though almost all the energy market experts anticipate additional European legislation, more than 70% expect shale gas production in the EU to grow in the next 5 years. This will in turn make it the key source of growth for natural gas production in the EU. As is the case in other countries, the future electricity mix in France is highly debated. This is largely due to the policy targets for greenhouse gas emissions, energy efficiency, and renewable energies at the European and national levels. The French national target for renewable energies, as a share of gross electricity generation by 2020, is 27%. The French government also aims to decrease the share of nuclear power in its electricity mix from 76% (current) to 50% by 2025. 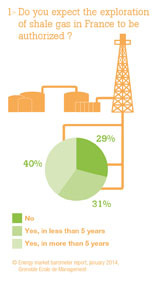 We asked the energy experts what their expectations on the distribution of fuel types within France's overall electricity generation would be in the next 10 and 30 years. The energy market experts expect the share of nuclear power in the French electricity mix, on average, to shift from approximately three quarters at present to approximately two thirds in 10 years, and to half in 30 years. Assuming a linear evolution over time, it would therefore take France about three times as long to reach the share of nuclear power intended by the current government. The declining share of nuclear power will primarily be replaced by renewable energy sources (other than hydropower). These are expected to increase from a current share of 5% to 13% in 10 years, and to 24% in 30 years. The share of hydropower in the French electricity mix is expected to remain fairly constant. The share of natural gas is expected to increase steadily, particularly over the next 10 years. It will nonetheless remain below 10% over the course of the next three decades. Finally, coal continues to play a rather marginal role, and it will even go as far as losing half its market share in the long term. In general, we have found that there are fairly substantial variations amongst the experts' assessments, reflecting the uncertainty about the future shares of energy sources in the electricity mix. In absolute terms, uncertainty (measured as the standard deviation) is roughly twice as high for nuclear power and other renewable energies as for fossil fuels, for both the projection periods. Uncertainties of all energy sources for the 30 year projection period are approximately 50% higher than for the 10 year projection period. The GEM Energy Market Barometer will survey the expectations of energy market experts on the development of energy prices in the wholesale market, on a regular basis. We therefore distinguish between the short term (6 months) and the medium term (5 years), and between the four main energy carriers, electricity, natural gas, oil, and coal. Most energy experts in our panel expect the prices of all energy sources to remain stable over the next six months. About 40% of the experts expect an increase in the wholesale prices of electricity, and about one third expect a rise in the prices of oil and natural gas. In contrast, prices of all energy sources (besides coal) are expected to rise in the medium term. In particular, more than 80% of energy experts expect electricity and oil prices to increase over the next five years. The EU Emissions Trading System (EU ETS) covers more than 11 000 power stations and industrial plants in 31 countries and is the EU's flagship climate policy. 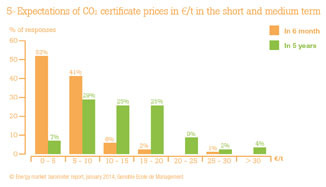 However, the current price of CO2 certificates is low (5.5 €/ton). The economic crisis has resulted in lower industrial activity and emissions of greenhouse gases across Europe. As a consequence, the demand for CO2 certificates has been lower than anticipated when the cap was set. Other reasons for the low certificate prices include a substantial and low cost supply of offsetting credits, possibly more ambitious energy efficiency regulations and stronger-than-anticipated development of renewables, all contributing to reducing the demand for CO2 certificates. Following months of discussions over the plan, in December 2013 the European Parliament and the Council agreed to temporarily remove surplus permits from the carbon market by postponing auctioning of emission certificates from 2014 on. This "back loading" is expected to bolster the certificate price. Our experts expect the price of CO2 certificates to remain low over the next six months (on average 5.4 €/t) and to increase over the next five years (on average to 14 €/t). It should be noted that this medium term price level is still too low to provide sufficient financial incentives to build a low-carbon economy in the EU, which would involve reducing greenhouse gas emissions by at least 80% by 2050, compared to the 1990 levels envisaged in the EU Energy Roadmap of 2011, among others. In its new EU framework on climate and energy for 2030 of 22 January 2014 the European Commission proposes a reduction of EU greenhouse gas emissions by 40% by 2030 as an intermediate target. As part of a structural reform of the EU ETS, the Commission suggests tightening the cap on the emissions permitted within the EU ETS after 2020. Further, the Commission proposes to establish a market stability reserve at the start of 2021, which foresees automatic adjustment of the supply of auctioned certificates depending on market liquidity. The European Council is expected to consider the new framework at its next meeting in March. Thus, the next Grenoble Ecole de Management Energy Market Barometer may ask our panel of French experts to assess the final outcome of the new 2030 energy and climate policy framework.